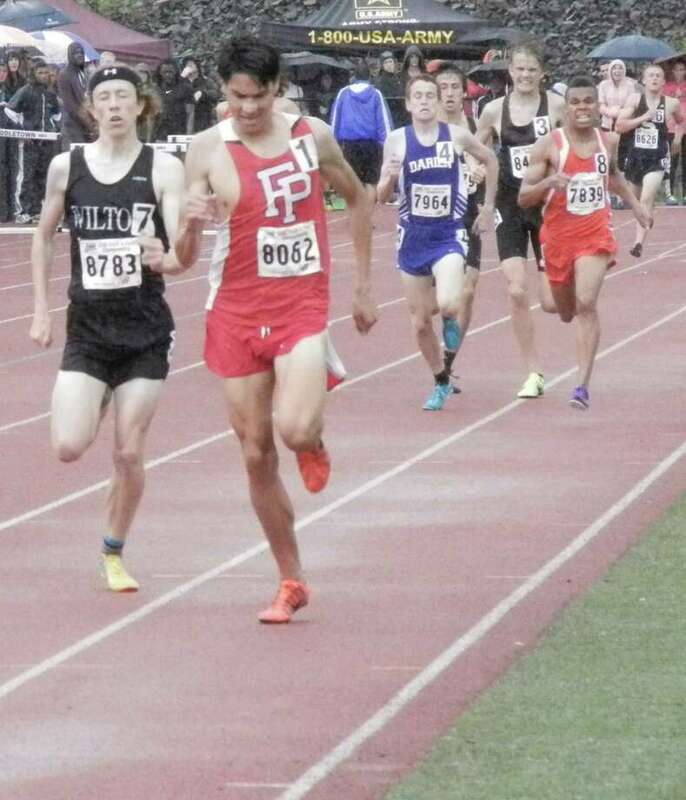 Fairfield Prep senior distance star Christian Alvarado was the top performer among boys and girls from Fairfield's four high schools on Monday afternoon at the CIAC State Open in outdoor track at Middletown High School's rain-plagued Rosek-Skubel Stadium track. A Fairfield Warde senior girl set a school record with her fourth-place finish. Alvarado, who will run at Georgetown University in 2014-15, won the 1,600- and 3,200-meter races, the metric mile- and two-mile runs. He was the only winner in individual events or relays among athletes from Prep, Fairfield Warde, Fairfield Ludlowe and Notre Dame high schools. Alvarado's plan adjusted when he saw how slow the field went out in the 1,600. He was aiming for a personal record in the event, then sitting out the longer race, the next-to-last event of the meet. It took him a little more than a minute on the track to mull it over in the first lap of four. So he made a calculated decision and backed off for the final three laps, focusing only on staying in front of everyone else. "I didn't go after it in the 1,600. I wanted to save up for the last lap," Alvarado said. "I wanted to have some energy left. I knew after the first lap, it would be hard for me to get my personal record. I decided to just settle for the win." He barely did. Many athletes at the State Open turned in times that were slower than the previous week at their state class meets because of the intermittent rain and the wet track. Alvarado's strategy nearly backfired. He didn't have much of a lead on Wilton senior Spencer Brown in the final 200 meters (half-lap). But Alvarado was strong enough to hold off Brown's challenge, winning by 0.05 of a second in 4 minutes and 12.38 seconds. Brown later finished third in the 800. The same scenario nearly played out in the 3,200. Alvarado repelled the hard-charging Alex Ostberg, a Darien junior, in the final lap. Ostberg nearly caught up in the final half-lap but Alvarado's small lead actually increased a little in the final meters. "After coming off a hard 1,600, I just wanted to play it conservatively and just use my kick at the end," said Alvarado, the State Open champion in cross country and the 3,200 indoors in the wintertime. "Alex is a really tough competitor. I knew he would challenge me. I wanted to try to be not too relaxed for the final lap." Alvarado won in 9:11.54. Ostberg finished in 9:13.34 a few meters behind. In the competition for team championships, in which Darien won the boys and girls titles, the Jesuits were eighth with 20 points among the 69 teams that scored points. No Mustangs, Falcons or Lancers boys placed in the top eight to score points. Among boys who did not score, the top finisher was Ludlowe senior Josh Archer, who placed 12th in the javelin with a throw of 155-feet-8 inches. He was seeded 10th. Warde senior Aidan Fiol finished 15th in the 3,200 in 9:35.78. He was seeded ninth. Prep junior Vincent D'Amore was 18th in the javelin with a throw of 146-feet. He was 13th entering the meet. Notre Dame-Fairfield junior Jake Heaton, seeded 15th, placed 22nd in the long jump with a leap of 19-1. In girls team scoring, Ludlowe was one of 13 schools to score eight points and finished in a tie for 27th place among the 72 schools that scored. Warde scored five points and placed 47th, along with seven other schools. Senior Cate Allen, of Warde, and junior Emma Koether, of Ludlowe, were the highest-finishing girls, each with a fourth-place effort. Allen's was more impressive because she was one of four runners in the 1,600 to break the previous meet record by Sarah Gillespie, of Northwest Catholic. Allen ran a 4:49.43, finishing 1.78 seconds behind winner Danae Rivers, of Wilbur Cross. Gillespie's time in 2012 was 4:49.89. Allen, who will run at Wake Forest next year, was seeded second from winning the Class L championship last week. She decided not to compete in the 800 and 3,200. After getting close to the school record in the metric mile on June 2 at the L meet, Allen eclipsed the 2010 Mustangs' record of Meg Ryan, which was 4:51.76. Koether was fourth in the 400-meter dash, finishing in 58.68. She was seeded sixth by placing second at the Class LL meet last week. She elected not to race in the 200. The Falcons' 4-by-400-meter relay of Koether, senior Kate O'Shea, sophomore Sullie Desmond and junior Rachel Hurst placed sixth with a time of 4:03.57. They were seeded sixth after being runners-up in Class LL. Ludlowe's 4x100 relay (junior Liz Buckley, O'Shea, senior Ali Johnson, Hurst) placed 18th. Ludlowe freshman Brianna Auray placed 14th in the 800 in 2:24.05. She was seeded 18th. Falcons' junior Olivia Auray, her older sister, who was not on the team at season's start, was 21st in the qualifying for the 100-meter hurdles in 16.9 seconds. She was seeded 25th. Warde senior Rachel Maltz, seeded 20th, placed 15th in the javelin with a throw of 103-8. Mustangs' junior Steph Sheehan was 26th in the 300-meter hurdles in 51.53. She entered competition as the 26th seed.